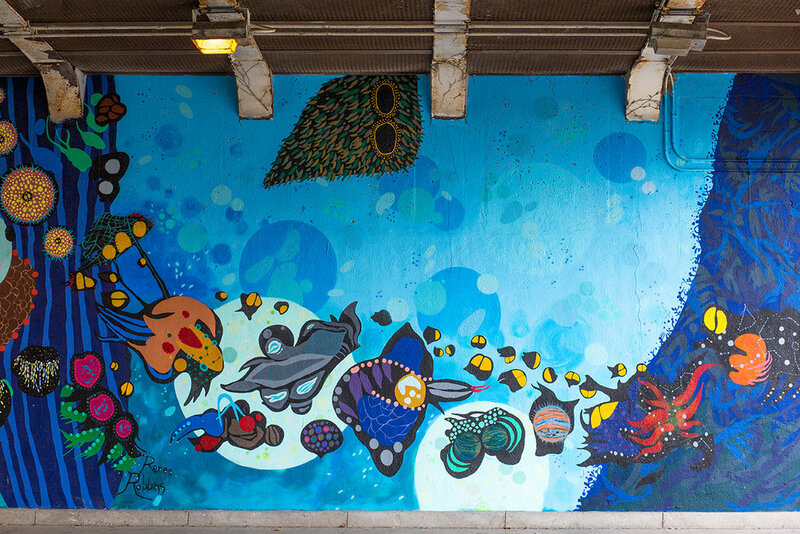 A mural project at the pedestrian underpass at Fullerton and Lake Shore Drive in Chicago, each measuring 14 ft x 110 ft. In partnership with Chicago Public Art Group and Fullerton Mural L3C. Photography by Shirley Naninni. Film by James Choi of Beechwood Pictures about the mural process. The artist’s layering of numerous extraordinary worlds—often hidden from view—encourages viewers to take a closer look at their surroundings. Forms in the work can be viewed as multiple things, giving a sense of the familiar but also creating mystery though abstraction. 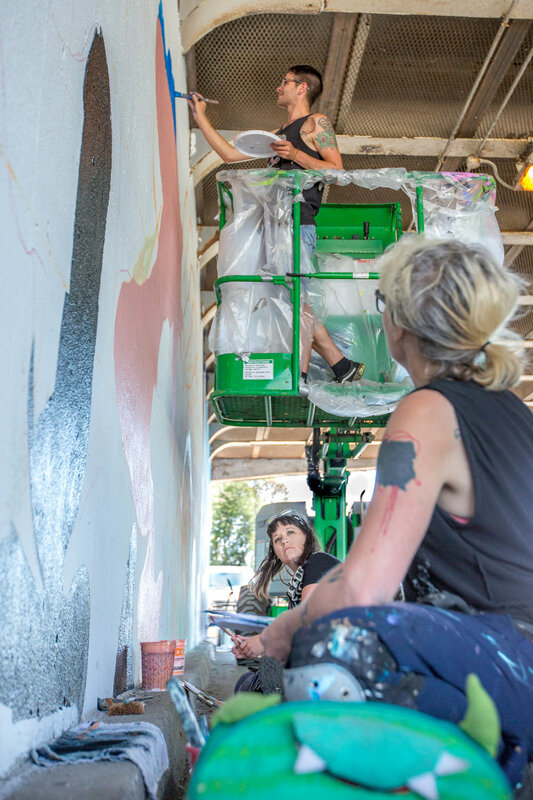 In collaboration with the Chicago Public Art Group and Fullerton Mural L3C, Chicago-based artist Renee Robbins transformed the pedestrian underpass at Fullerton and Lake Shore Drive with two monumental murals, each 14 feet tall x 110 feet long. The project, titled A Kaleidoscope of Hidden Worlds, considers the complex relationships between humans, nature, and the cosmos. The south wall composition moves from micro to macro as pedestrians travel from west to east through the underpass. It begins with neutrinos or subatomic particles and then layers molecular diagrams of the colors Cadmium Red, Cadmium Yellow, and Ultramarine Blue. The scale increases with patterns derived from diatoms and microscopic images of butterfly wings. Weaving in and out of the composition are trails of different species of fireflies, all flirting for attention in a dazzling spectacle. At the end of the centrally placed forest image, the composition zooms out to the cosmos with a large circular shape set amidst the celestial whirlpool. The parade of images on the north wall envisions the world underneath Lake Michigan just out of reach. In a similar way to the south wall, the scale of the composition moves from small to large as pedestrians walk through the underpass toward the lake. 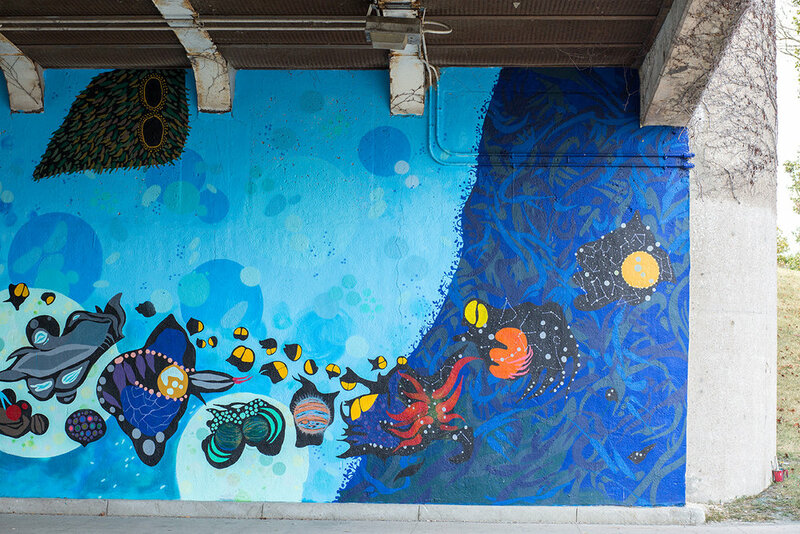 Many of the shapes and patterns are inspired by local aquatic species that inhabit the unique ecosystem around Chicago’s Morgan Shoal, a geological area containing the remnants of a reef and also the site of the 1914 Silver Spray shipwreck—a former passenger vessel, which is the same length as the mural walls. The painting considers the past, present, and future of our local ecology and offers a kaleidoscope of biodiversity. all contents © Renee Robbins 2018. All rights reserved. Protected under US copyright laws. No portion of the artist's images or statements may be used, downloaded, or reproduced in any way without prior written permission from the artist.